You are mostly welcome to visit a Permanent Future Lab at the [[Locations|location]] of your choice. Devices currently discoverable are innovative [[:Category:Technology|technologies]] like [[:Category:Robotics|robotics]], [[:Category:Virtual_Reality|Virtual Realty]] and [[:Category:Internet of Things|Internet of Things]] items. At every location, however, the discoverable technology differs. Therefore, complete overviews are created per location at designated pages. Devices currently discoverable are innovative [[:Category:Technology|technologies]] like [[:Category:Robotics|robotics]], [[:Category:Virtual_Reality|Virtual RealIty]] and [[:Category:Internet of Things|Internet of Things]] items. At every location, however, the discoverable technology differs. Therefore, complete overviews are created per location at designated pages. Permanent Future Lab (PFlab) is a publicly accessible [[locations|location]] where the newest technology is being shared. Currently there are a few in the Netherlands and one at Bali. At those locations anyone can play, discover and exchange new ideas through available technology or by learning from other passersby. Available technology varies highly from robots, brainscanners, VR headsets to Internet of Thing devices and mini controllers. And the types of people you can meet vary from lab to lab and from time to time; from first-timers to real geeks. Permanent Future Lab (PFLab) is a publicly accessible [[locations|location]] where the newest technology is being shared. Currently there are a few in the Netherlands, one at Bali and Bangladesh. At those locations anyone can play, discover and exchange new ideas through available technology or by learning from other passersby. Available technology varies highly from robots, brainscanners, VR headsets to Internet of Thing devices and mini controllers. And the types of people you can meet vary from lab to lab and from time to time; from first-timers to real geeks. * Every physical PFLab is located within a place that is being shared by others. * Technology available at a PFLAb is being shared by people and other parties, without any direct commercial interest. * At some PFLabs visitors are being welcomed by hosts, sharing their time, kindness and knowledge. Having a host is however an option and can be done by people or other forms. * Experiences, new knowledge and innovations are being shared by hosts, visitors, ambassadors and fans. The world is changing rapidly, mainly caused by upcoming new technology. Like most novel products, new technology does not necessarily match the needs of current society. Moreover, new technology can influence society on a different level and scale with disruptive consequences, especially if it is connected to the digital world as we know it today. The movement stimulates the society to think about these new developments by activities such as: [[sharing]] knowledge online, exchanging ideas face to face and by organizing recurring meetups. * Social Media: You can share via one of the existing social media channels or start a new one. Current existing ones: Twitter ([https://twitter.com/permanentfuture @permanentfuture], [https://twitter.com/pflab @PFLab]), [https://www.linkedin.com/company/permanent-future-lab LinkedIn], or one of the Facebook groups ([https://www.facebook.com/groups/permanentfuturelab this one] is a good starting point). * Slack chat: Talk with other enthusiasts to get things done together at [[Slack]]. Permanent Future Lab (PFLab) is a publicly accessible location where the newest technology is being shared. Currently there are a few in the Netherlands, one at Bali and Bangladesh. At those locations anyone can play, discover and exchange new ideas through available technology or by learning from other passersby. Available technology varies highly from robots, brainscanners, VR headsets to Internet of Thing devices and mini controllers. And the types of people you can meet vary from lab to lab and from time to time; from first-timers to real geeks. 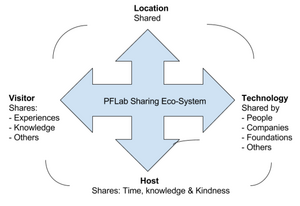 Every physical PFLab is located within a place that is being shared by others. At some PFLabs visitors are being welcomed by hosts, sharing their time, kindness and knowledge. Having a host is however an option and can be done by people or other forms.